17 Camera Messenger Bags (Hands-On Review): What’s the best messenger bag for photographers? I still remember my first love. Sure, she was used and carried a lot of baggage, but that’s what gave her personality. The first owner probably didn’t appreciate her the way that I did. I was new to this. I didn’t know what I was looking for and didn’t know what I was getting into. We had a great relationship until I realized I needed more. More space in my life. More space to carry, well, more baggage. She always held a special place in my life and always will. To others she was just a camera bag, but to me she was the first of my addiction. She was a Domke. The gear I used for these tests include one Canon 5DMIII, one Canon 7DMkII (both with dual battery handgrip), Canon 70-200 2.8, Canon 24-70 2.8, Canon 16-35 2.8, Canon 50 1.2, Yongnuo flashes, 15” MacBook Pro, and my MeFoto tripod. I’m not giving all the dimensions. You can look those up easily on your own. I’m sharing my thoughts about the bags, what I liked, and what I didn’t care for. Join me on Instagram to see more about these bags as well. What better place to begin than with where it all began. The Domke bag has definitely advanced since the first one I owned. This bag is made with a great durable canvas material. There are many expandable pockets which do a great job of allowing or conserving space for all the little extra gadgets that photographers like to have. The zippers glide smoothly, and the buckles and straps are very durable. The internal compartment needs to be reworked in my opinion. The Velcro dividers rip off too easily when reaching in and moving things around. As the bag expands, the dividers do not expand causing the Velcro to rip off. They do, however, have a variety of dividers that include extra pouches and pockets to allow you to customize internally. The padding securely protects all of your gear. There is a back pocket slot that easily holds the 15” laptop and another back pocket slot to store or carry magazines or any additional papers or even and iPad, but it is not padded. Overall, I think this is a decent bag for taking with to any type of shoot whether it’s a portrait, wedding or even travel. You can pick one up here on Amazon! 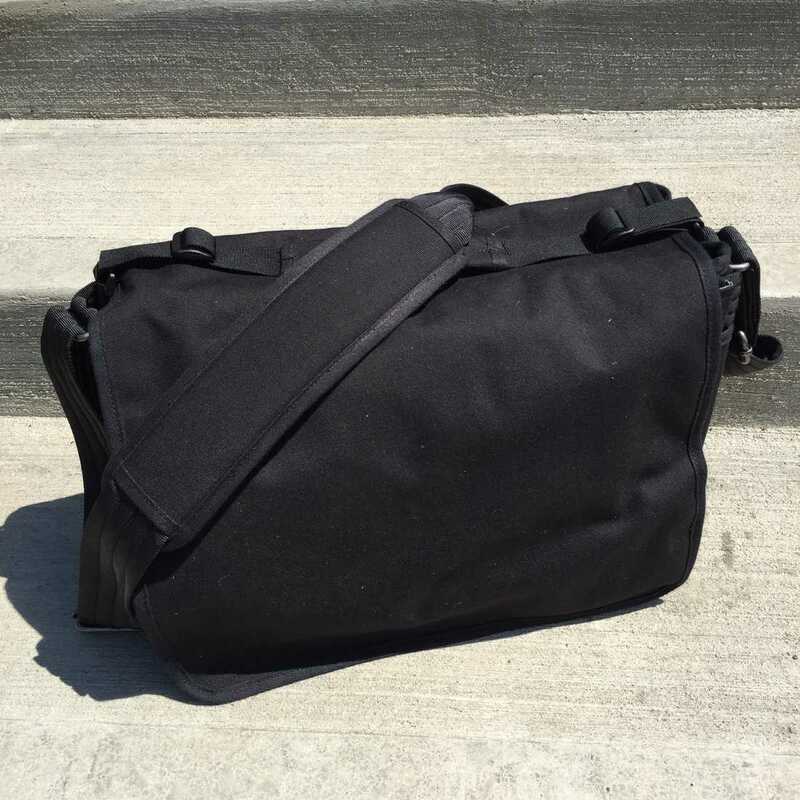 This Think Tank Retrospective bag is what I like to call a workhorse. I have used it for many NFL games this year because it allows me to carry two camera bodies, three lenses, and even two flashes. There are many internal pockets to keep batteries, memory cards, pens, etc. all separate from each other. There is also a zipper pocket inside for something larger such as an iPad. A pocket on the backside allows you to carry an iPad or 10” tablet. Two straps on the sides can be used to attach anything, which I used to carry my tripod as I slide one leg through a strap. The shoulder strap has a great pad with strips of rubber on it to keep the bag from sliding. The one thing this bag does not have is a lot of padding. The internal dividers are thin and provide just enough protection; however, the shell consists of just the material itself. My favorite thing about this bag is the expandable pockets in the front that can be as flat as the bag or expand to hold my camera body with dual battery pack attached. Obviously, the padding isn’t that much of a concern of mine since I continue to and will continue to use it for NFL games. The cover stays closed by big Velcro straps. 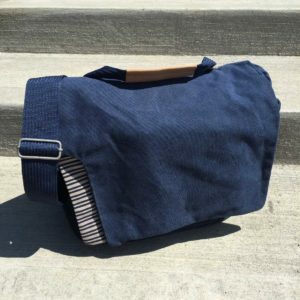 The straps have a silencer, or ability to prevent the Velcro noise; however, then the cover simply hangs in front of the bag instead of being attached to it. This is a great bag for portraits or events, but the Velcro may steer people away from taking it to a wedding. Pick one up here at Amazon! I like to refer to this bag as the gadget photographers bag. They seem to have a spot for every type of gadget the photographer will carry. From a zipper along the bottom of the bag that allows 2” of more space, to the elastic hinge that keeps the cover held back, they tried to include everything into this bag. I’m not a fan of the bright yellow interior that stands out, but this is intentional so that you can see smaller things better in the bag. The shell is a nylon material and it comes with an all-weather cover to wrap over it. Compared to the other bags, it doesn’t feel like it’s of the highest quality. The strap is durable, but the pad lacks much padding. The internal divider is a pouch that comes out to use the bag for other reasons. The Velcro dividers are customizable and come in different heights. This is a thinner, deep bag that allows for stacking a lens on top of another or laying down a flash across the top. This bag would be good for a portrait shoot or used for traveling with your camera. I don’t see many serious photographers using this as their main bag, but for the price it’s hard to beat. Pick one up here on Amazon. Another workhorse, this bag is HUGE and holds tons of gear. Everything about this bag feels durable and made with quality. It claims to hold up to a 15” laptop, but you could easily fit a 17” by the width of the slot. The internal compartment is removable to use the bag as a travel bag for clothes and even shoes. The removable compartment can be zipped up and has a handle to easily transport. There’s just enough padding around it, and the dividers are the thin origami style allowing you to easily adapt to fit different gear. There aren’t a lot of bells and whistles to this bag. It simply does what it needs to. There are a few bigger pockets inside the bag that could each hold an iPad mini. Zippers move smoothly and the shoulder strap is adjustable. The strap is designed in a way that you can wear it across your chest and have the bag almost like a backpack at an angle. It’s extremely comfortable. Straps at the bottom of the bag allow a tripod to be attached. The versatility of this bag makes me want to recommend it to everyone, especially if you travel and need to carry a few extra things. I’m blown away by the price for the quality of this one! Pick one up here on Amazon. On the topic of travel, Pacsafe is known for making their bags specifically for people that travel and want to keep things safe and secure. 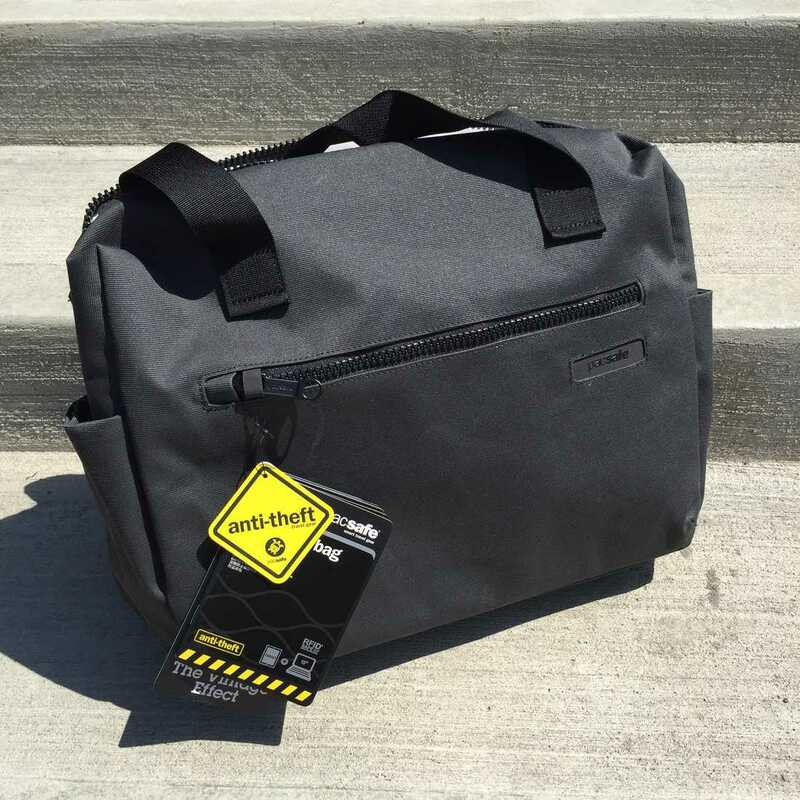 From the wires through the straps that make it hard for someone to cut off of you to the RFIDsafe pockets that keep your identity protected, this is a GREAT bag for photographers that travel. The poly canvas shell has wires inside to prevent someone from slashing your bag to access it. Internally, there are no dividers so you would need to get those elsewhere. The origami style dividers would be best with this bag because space is limited. I carried my 70-200, 24-70, and a camera body. The bag holds up to a 15” laptop and an additional spot for an iPad. There are designated pockets for your phone, memory cards, id, etc. 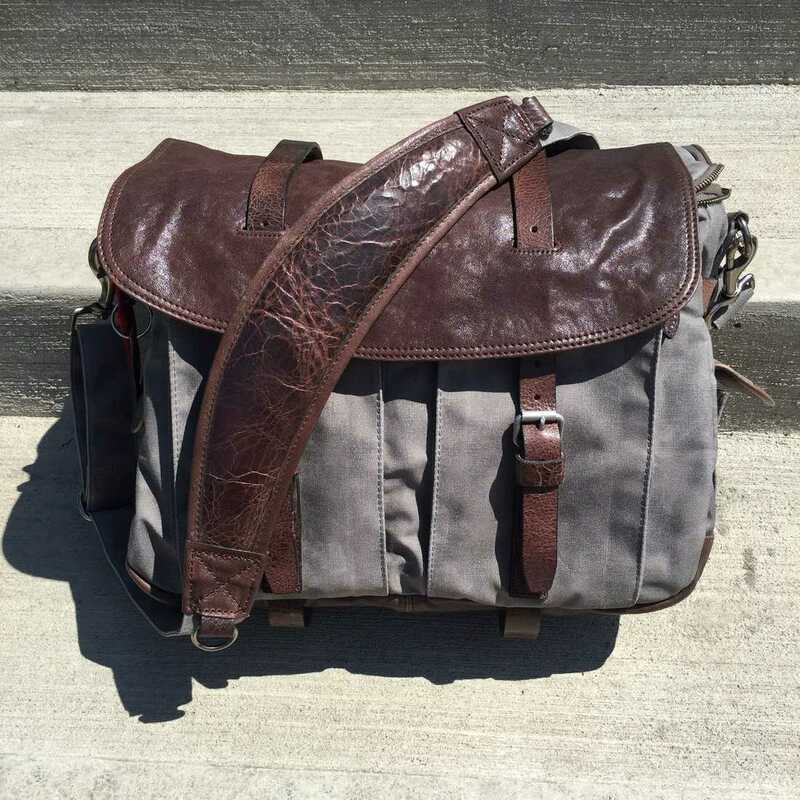 This isn’t the type of bag you would use for a basic shoot, but it’s perfect for anyone traveling overseas. Pick one up here on Amazon. Think laptop bag that carries camera gear. 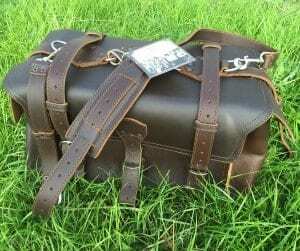 This is a beautiful bag made with quality canvas material and leather. The best thing about this bag is that a portion of the proceeds go towards Thirst Relief and provides a LIFETIME of clean drinking water for up to four people. 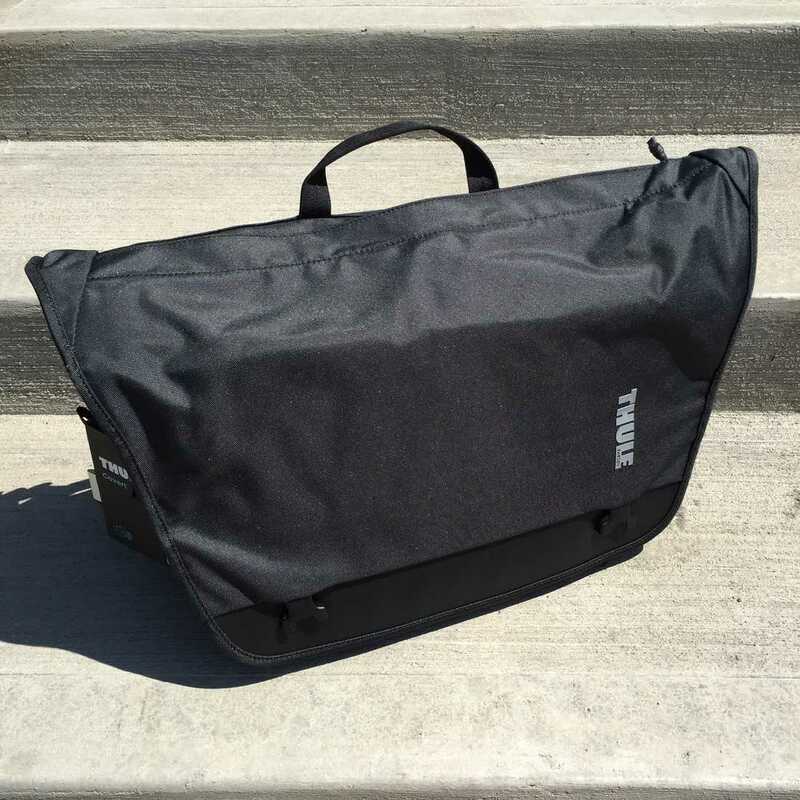 Unlike other laptop bags, this one is designed specifically for photographers. The shoulder strap has a small pad with just the right amount of comfort. One side pocket is pretty much useless. The other side pocket zips and has plastic slots sewn in for memory cards. Two front zipper pockets expand to hold something the size of a couple memory card cases. Personally, I would never place my memory cards in the side pocket because there is no hard shell to protect them. Inside the bag are adjustable Velcro dividers for both the lenses as well as the laptop. This allows you to remove all of it if you want. I’m not a huge fan of how the laptop divider is attached with the Velcro on the bottom of the bag. When I put my laptop in, it makes a Velcro noise on the bottom inside where it pushes up against it. I will say though that the Velcro is strong unlike some of the others I’ve tested. There are no pockets inside the bag, just one more in the front about the size of a mini iPad and another on the back that would hold magazines or papers and has a magnet to close the top. The buckles on this bag are brass and give quick access to gear. Pick one up here on Amazon or at KellyMooreBag.com and use coupon code “Improve” for $20 off. Small and mighty is how I’d describe this bag. Similar to the Ape Case mentioned above, this bag has lots of little pockets and spaces for the many things photographers carry. There is a slot on the back for a 13” laptop, a slot inside for an iPad, and a side pocket that unzips to carry a water bottle. Clips in the front keep the top flap closed and there are extra Velcro straps on top of the bag to attach anything else. The outer shell is made of a nylon material and inside is a removable compartment with handles and a strap. With the compartment out, the bag can be zipped to decrease its size. Padding is only in the compartment so I wouldn’t carry any gear in this bag without it. In my opinion this bag would be best for a mirrorless because a 70-200 is too tall to fit in the bag and wider lenses like a 16-35 would take up too much space. It’s a decent little bag overall, but not one I would recommend to professional photographers. Pick one up here on Amazon or use coupon code “IMPROVE” for 30% off at NaneuBags.com. Sometimes it’s hard to pass up on a bag, even if its price is cheap. This bag has TONS of great reviews on Amazon. This is another bag best for mirrorless. It has a removable insert with dividers but I could only fit my 70-200 and one camera body. With the insert out, it feels like a canvas purse that stays closed with magnetic snaps. With the insert out, it’s spacious on the inside with one small zipper pocket. Around the bag there are two pockets in the front each about the size of an external hard drive and two side pockets that I would only put batteries or pens in. The strap is sturdy but lacks padding. I would avoid this bag mainly because of one reason – the zippers. They feel sharp and will scratch your hand each time you reach in to grab something. If you can put up with the scratching, $57 is hard to pass up if you’re in need of a bag. Pick one up here on Amazon. As a history lover, this bag starts with bonus points to me because it’s designed with a WWII inspiration and is hand made in Taiwan. 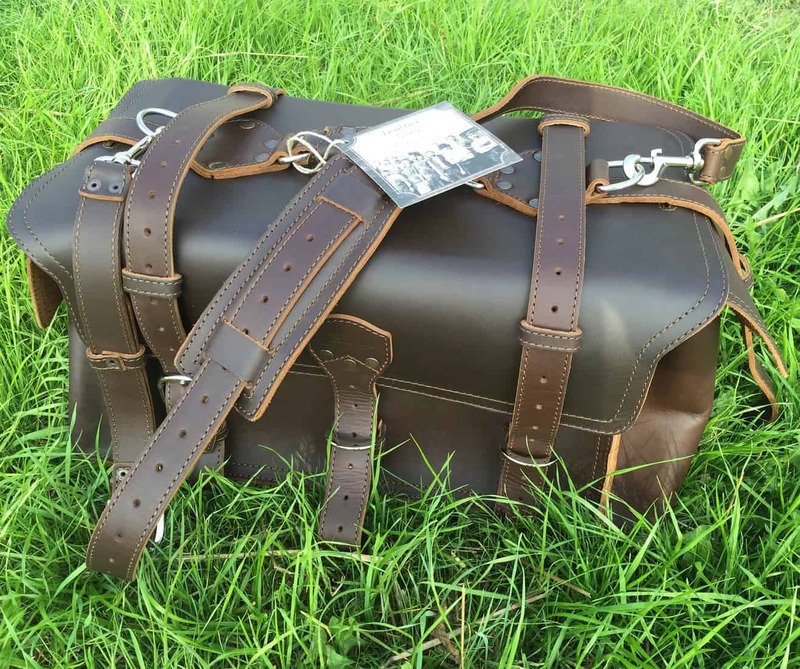 When you have a bunch of bags in front of you there are some bags that just look cheap and then there are others that scream out quality and style – this is one of those that screams! It’s a workhorse with style. Made from a waxed canvas and different leathers with strong straps and clips, the cover stays closed with snaps in the front. Two expandable pockets in the front are about the size of an external hard drive and snap shut. Two small pockets on the sides are too small for much more than batteries. 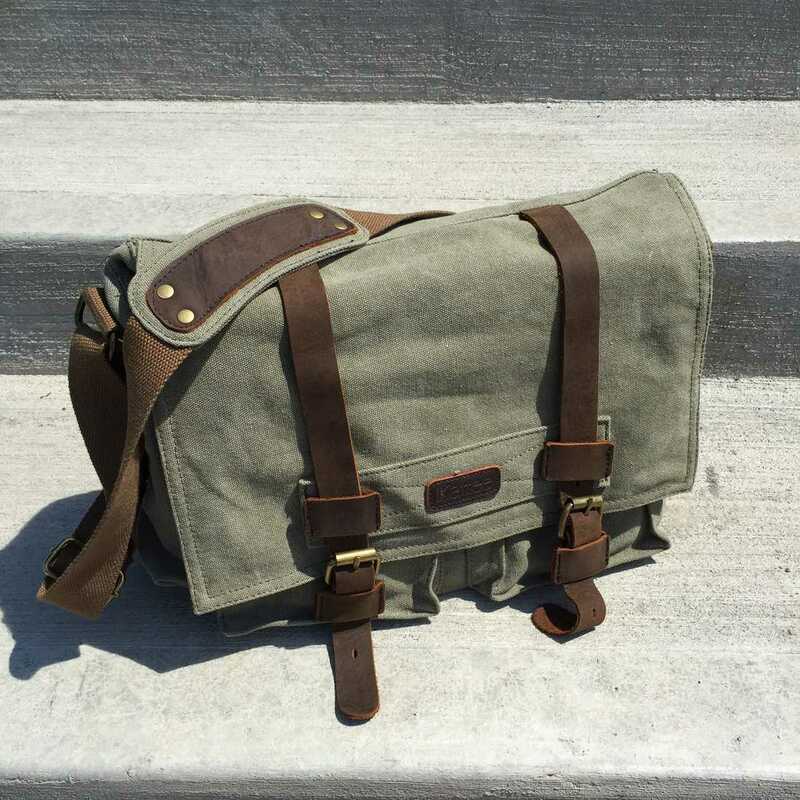 The shoulder strap is also made of the waxed canvas and has a comfortable padding sewn in place. The removable internal compartment can hold multiple lenses with bodies attached. They even have a fully waterproof compartment that you can buy separately. There’s enough space around the compartment to slide in a flash on both sides. There’s no official slot for them, but still plenty of room. There’s also a slot for a 15” laptop and straps on the bottom of the bag to attach a tripod. Because this bag is hand made you can preorder it here at their site. Think workhorse + leather. I can fit my four lenses, two flashes, and two bodies in this bag packed tightly. The back has a slot for a 15” laptop and a separate slot that can hold an iPad mini or zip open to slip on to the handles of a luggage bag. The cover snaps closed with a quick release push button snap. Two tall pockets on the front have plenty of room for memory cards, external hard drives, etc. Two side pockets are fairly tight and not very useful. This is a very tall bag; the good thing is that it can hold a lot; however, you would need to move gear around on the top to get what’s underneath. I used this bag at a wedding but think it’s too big to carry around at a portrait shoot if you’re the type that likes to be on the move with your bag. Pick one up here on Amazon. 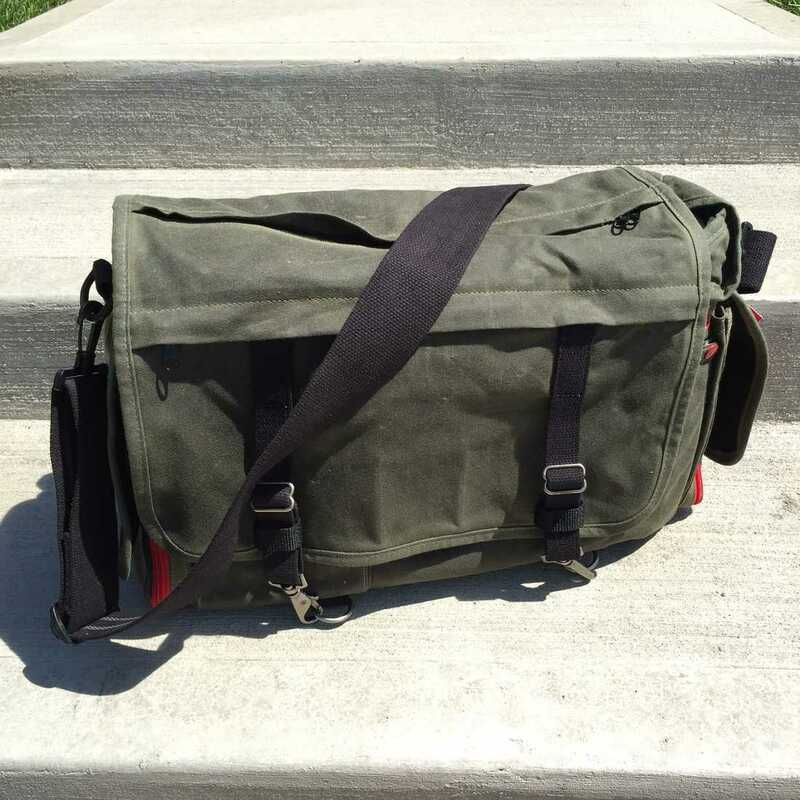 Created by two cousins in Germany, this is a compact bag that holds just the right amount of gear and doesn’t bother with side pockets that are so often useless. It’s tall enough to hold a 70-200 with room for another lens, camera body, and even a flash. There are two zippers on the front edges that zip down the bag to allow easy access to anything in the bottom. The Velcro dividers are the typical padded type and adjustable. A pocket inside the back holds a 15” laptop and a zipper pocket in the front has room for pens, memory card case, and external hard drives. 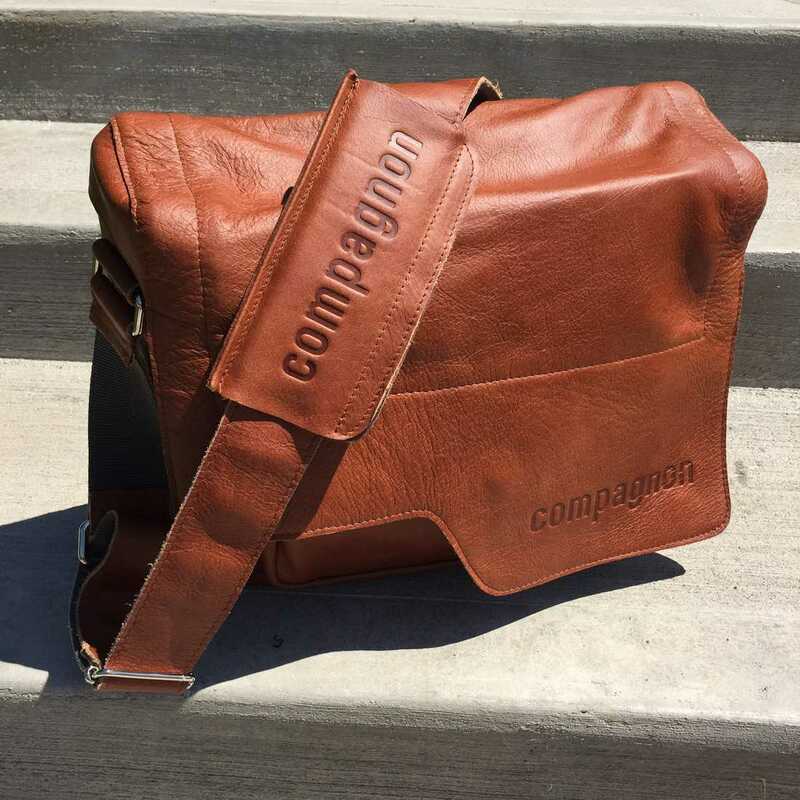 The name “Compagnon,” which I believe means “companion” in German, is printed largely across the front of the bag as well as on the shoulder strap bag. I like how this bag can hold the basic gear needed for a portrait shoot. I don't prefer the material around the zipper, which instead of being sewn into the bag, the leather hangs loose as if they forgot to stitch it, which they didn’t. The zipper itself is smooth and works well. This would be a decent bag for weddings or portrait photography. Pick one up from Germany here. Use code “compagnon-improphoto-free-shipping” for free shipping from Germany thru November. Take a beautiful piece of leather and just stitch it together. Another simple bag, there are no bells or whistles with this one. The camera strap is adjustable like a belt and the shoulder pad is just an additional piece of leather. Outside there is one large pocket in the back (perfect for magazines but I wouldn’t carry my laptop in it) and the cover is simply a leather flap that folds over the bag and hangs there. This specific bag does not have any buckles or clips to keep the flap closed. 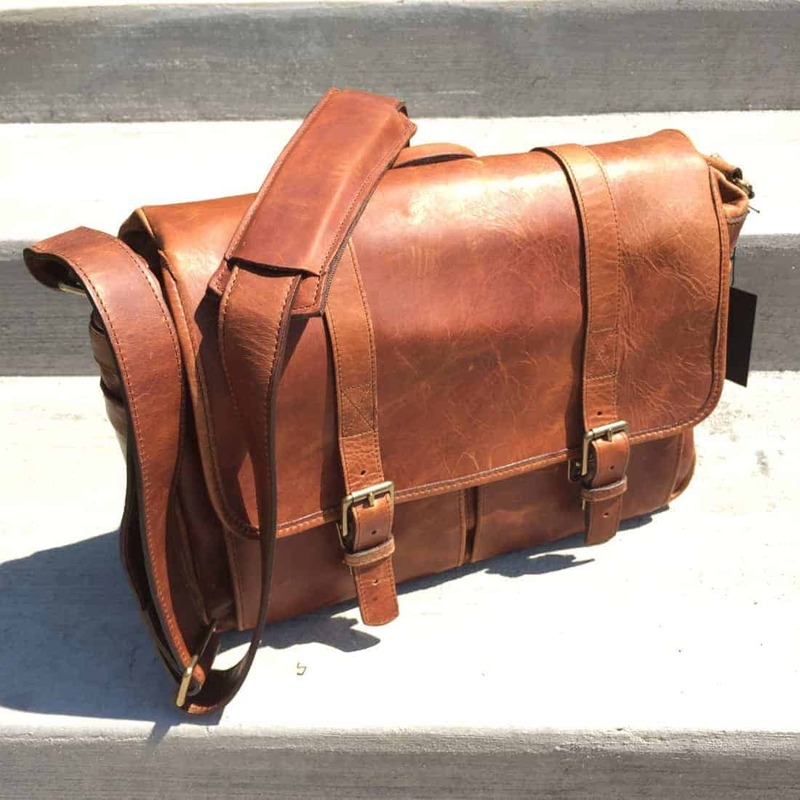 This bag truly is just a few pieces of leather sewn together. There is no padding added anywhere. Inside there are two pockets on the back. So how would you carry your gear? 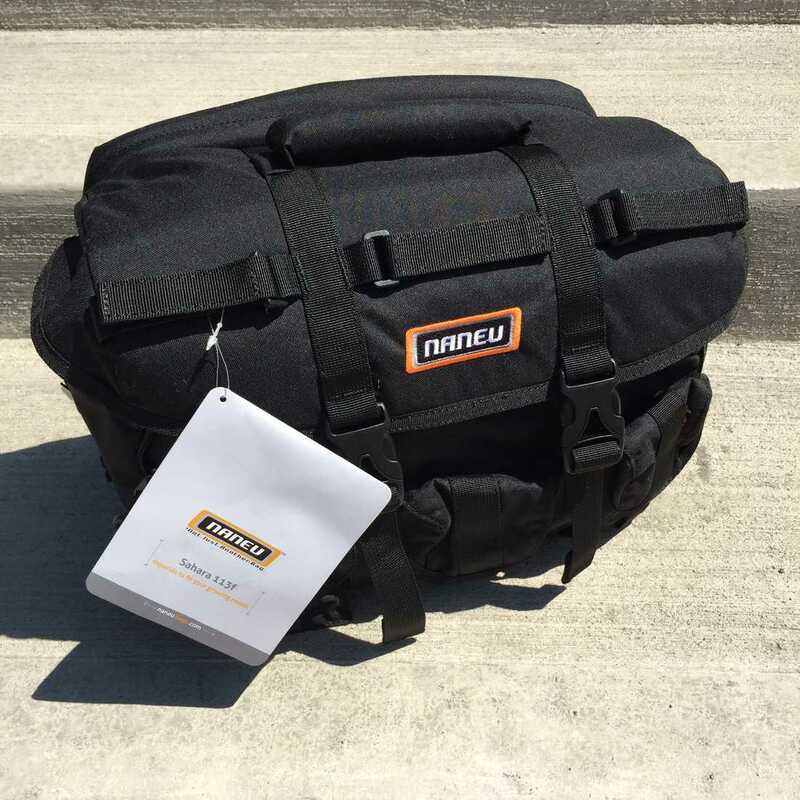 This bag comes with a removable compartment with Velcro dividers to separate your lenses and camera body. Remove the compartment and you have a beautiful laptop bag – I would just be sure to have the laptop in some type of neoprene sleeve. It’s easy to access your gear because you just have to flip open the flap and it’s there. My only concern would be that if in the wrong position, gear could fairly easily fall out. Great bag for wearing around at a wedding or portrait shoot. Pick one up from Copper River and use coupon code “IMPROVE” for 8% off. 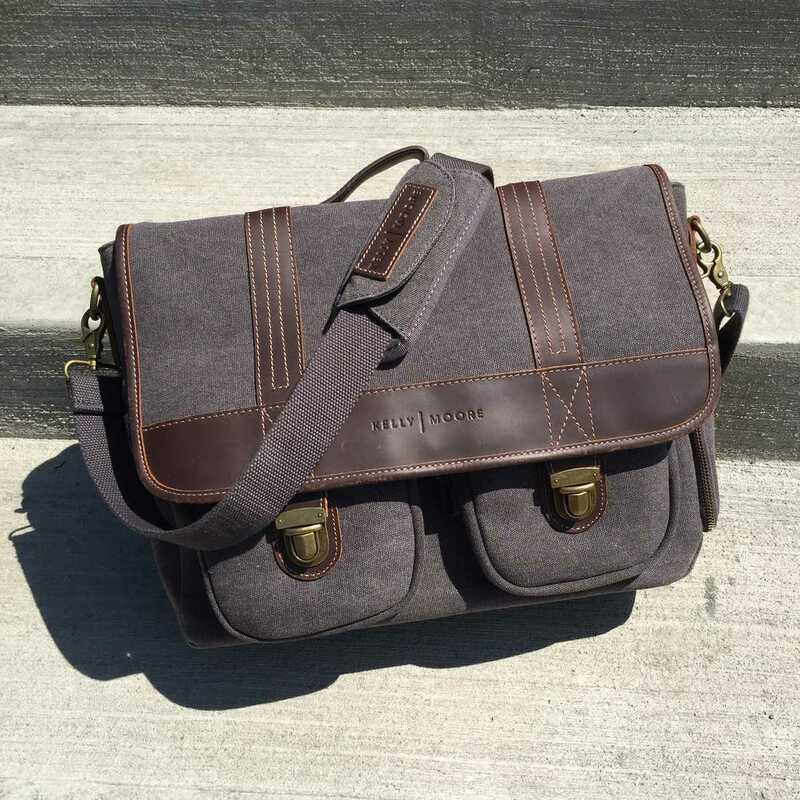 If you’re a mirrorless shooter looking for a leather bag or just walk around with one DSLR and one lens, the Buffalo Jackson Everett bag may be a good fit for you. Smaller than the other bags I’ve received, this bag could carry an iPad or small tablet. It’s a decent little bag to carry around and wouldn’t weigh you down at all. This bag feels like it’s made more from a real raw piece of leather compared to some that seem more finished or processed. The belt type buckles and straps don’t scream out comfort. There are two pocket slots on the back of the bag – one with a zipper and one without. A pocket on the front can hold memory cards, batteries, etc. I’m not sure what they were thinking with the padding inside. It seems like they just took a bunch of padding and stitched it together. They definitely could have used a tighter pad that would provide as much protection without taking up as much space. There are two large flaps that open from the top to the side of the bag and then fold over the top to protect gear from weather – interesting. Not a bad idea but doesn't seem to make a real difference and instead adds one more step to accessing your gear. Pick one up at Buffalo Jackson here and use coupon code “IMPROVE” for 10% off EVERYTHING. 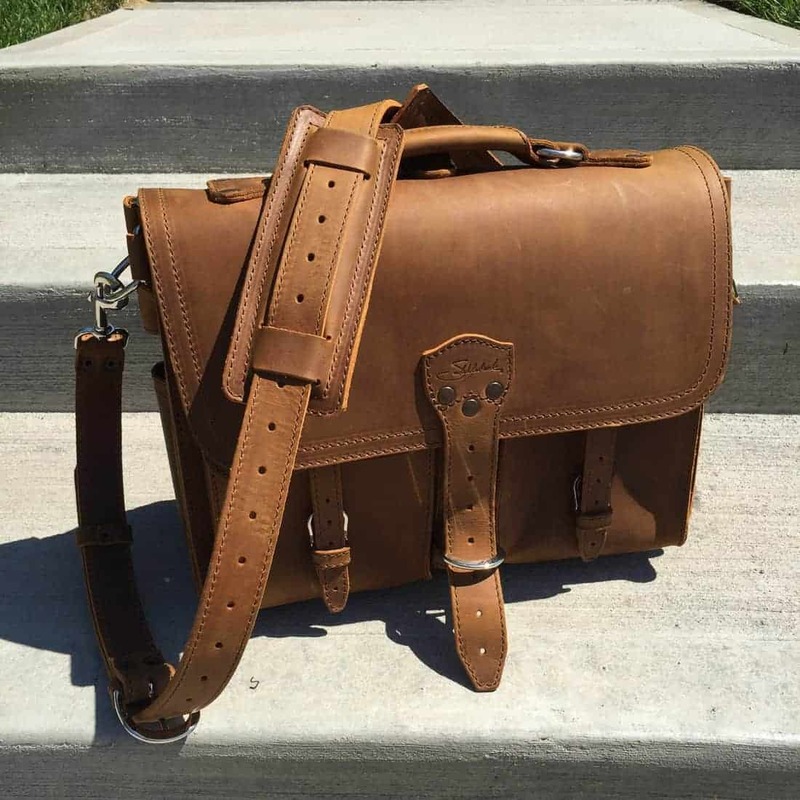 If quality leather is defined by it’s price, the Saddleback Classic Briefcase is made from the best. These bag reviews support the adage “you often get what you pay for”. This isn’t a cheap bag – this isn’t cheap leather. The company is called Saddleback for a reason. 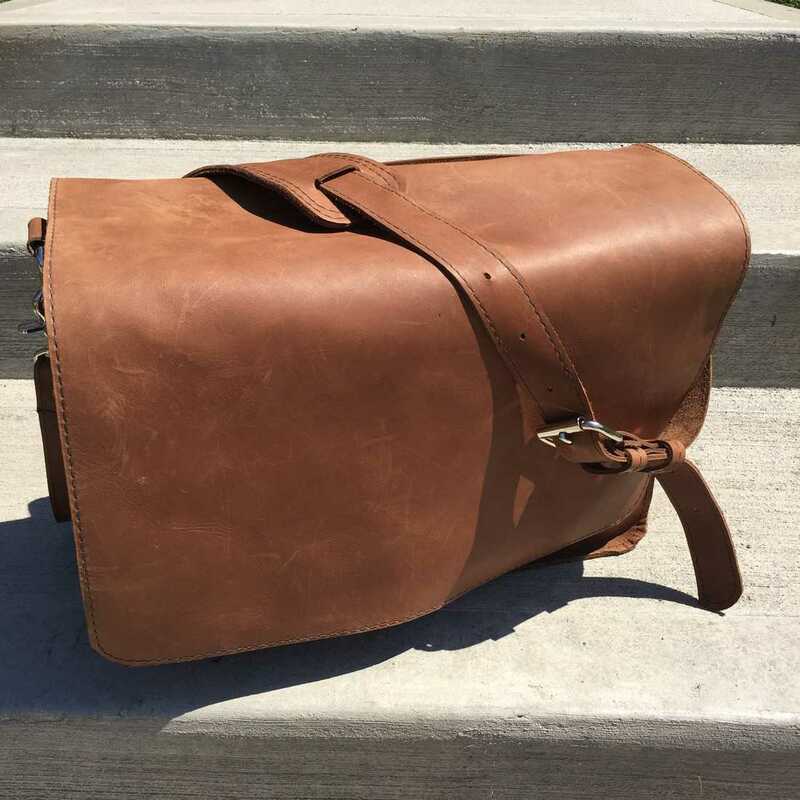 This bag is made from very thick leather. Imagine taking a saddle, putting a few pockets on it, and then add your camera gear. Even the buckles feel great! This specific bag has two pockets in the front just the right size to hold a laptop cord wrapped up. A slot between the pockets and slots on both sides of the bag aren’t the most useful but would work for something thin and tall like pens and pencils. An open pocket in the back is ideal for magazines. The shoulder strap comes with two pads – WHAT? WHY? Good question. The strap can be removed and wrapped through an additional ring to transform the bag into a backpack. So here’s the problem… it doesn’t hold normal camera gear very well unless you shoot mirrorless. The issue lies on the inside. Inside is a large section with a dividing piece of leather right down the middle of the bag. Why is that a problem? Because neither side is big enough for DSLR lenses without being squeezed by the leather and there is no internal padding. To make clear, this is my fault. I requested this bag thinking it could hold up, and it could work. 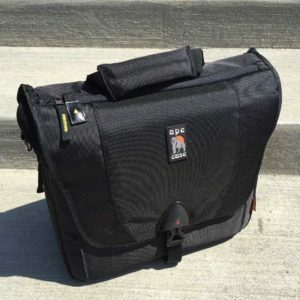 If you have mirrorless gear, then there’s plenty of room in this bag with extra space and you’ll love it. Pick one up here on Amazon. 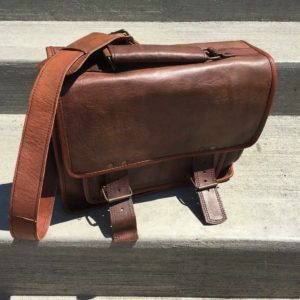 If you want a Saddleback leather bag for your DSLR and lens or two, you’ll need to get your own insert, but check out the Saddleback Gadget Bag. Desperate to find one of their bags that would work for me, I went with the Saddleback Side Pocket Duffel. It fits my tripod inside with a compartment divider for some gear and room for me to set more on top and even in the side pockets. It’s not a messenger bag, but it’s what I would use from Saddleback. You can grab one here. Think laptop bag for your camera gear. I have received more compliments on this Ona bag than any other of the bags I’ve been reviewing. That shouldn’t be a surprise because you can tell by the picture it’s a gorgeous bag. I love how it is breaking in and aging nicely. I’m also a big fan of the push snaps that allow you to quickly lock and access your gear. The back of the bag has a slot for magazines and papers. Two large pockets on the front can easily hold a laptop power cord and a few extras. Two side pockets aren’t the most useful, but most pockets located here aren’t. At least these are broken in enough to reach inside for batteries or other small objects. Inside the 13” laptop space is divided from the gear with Velcro padding. The dividers are adjustable and stay in place as desired. There’s enough room inside for a DSLR with a few lenses. The shoulder strap slides to be adjusted and has just the right amount of padding. 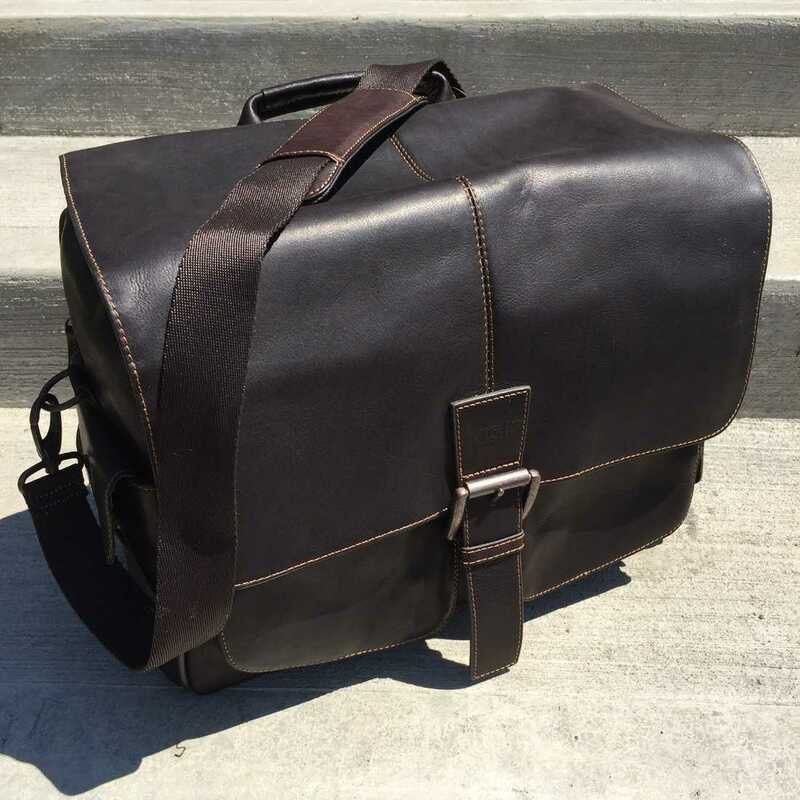 If you’re looking for a leather laptop bag for your camera gear – it doesn’t get better than the Ona Leather Brixton. Grab one here from ONA. Ultimately, I’ve learned from reviewing these bags that if you’re a photographer that doesn’t specialize in just one type of photography there still doesn’t seem to be just one perfect bag for all occasions. For those of you who do have a bag addiction, like me, here are the bags I’m keeping in my collection: Think Tank Retrospective, Thule Covert, Wotancraft Ranger, and Ona Leather Brixton. I hope that this review has been helpful. I am not being paid by any company for writing my thoughts and opinions. I simply want to help others in their journey of finding a bag that best suits their needs.